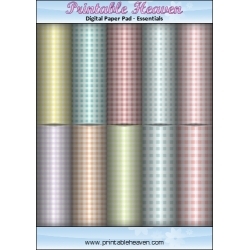 Digital Paper Pads There are 83 products. 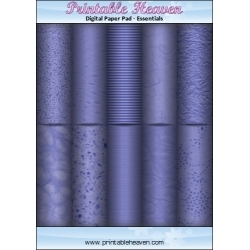 This fabulous Printable Heaven digital paper pad contains 10 co-ordinating A4 images that you can print over and over onto good quality paper or card, whatever suits your project.This pad feature 10 sheets of purple paper effects. 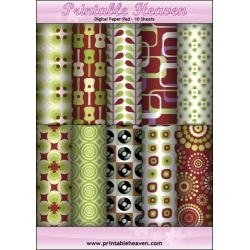 Choose from corrugated, crinkle, leatherette, two dew drop prints, mica, waterdrop, linen, mulberry and glitter. 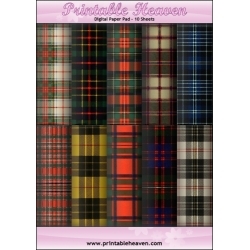 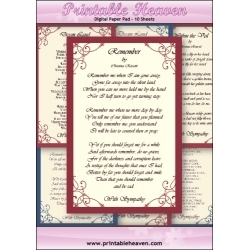 This fabulous Printable Heaven digital paper pad contains 10 co-ordinating A4 images that you can print over and over onto good quality paper or card, whatever suits your project.This pad feature 10 sheets of blue paper effects. Choose from corrugated, crinkle, leatherette, two dew drop prints, mica, waterdrop, linen, mulberry and glitter. 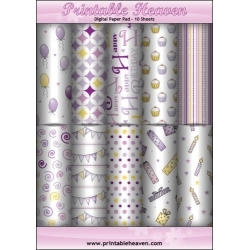 This fabulous Printable Heaven digital paper pad contains 10 co-ordinating A4 images that you can print over and over onto good quality paper or card, whatever suits your project.This pad feature 10 sheets of lilac paper effects. 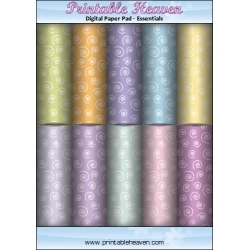 Choose from corrugated, crinkle, leatherette, two dew drop prints, mica, waterdrop, linen, mulberry and glitter. This fabulous Printable Heaven digital paper pad contains 10 co-ordinating A4 images that you can print over and over onto good quality paper or card, whatever suits your project.This pad feature 10 sheets of lemon coloured paper effects. Choose from corrugated, crinkle, leatherette, two dew drop prints, mica, waterdrop, linen, mulberry and glitter. 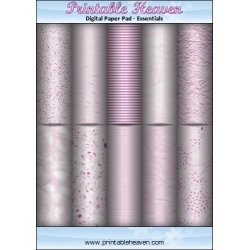 This fabulous Printable Heaven digital paper pad contains 10 co-ordinating A4 images that you can print over and over onto good quality paper or card, whatever suits your project.This pad feature 10 sheets of baby pink paper effects. 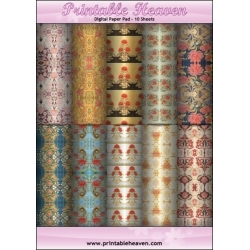 Choose from corrugated, crinkle, leatherette, two dew drop prints, mica, waterdrop, linen, mulberry and glitter. 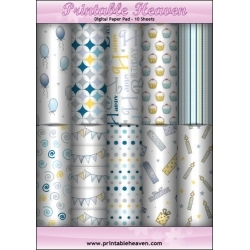 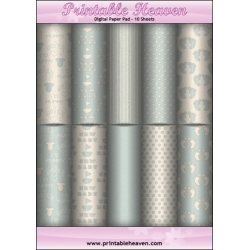 This fabulous Printable Heaven digital paper pad contains 10 co-ordinating A4 images that you can print over and over onto good quality paper or card, whatever suits your project.This pad feature 10 sheets of baby blue paper effects. 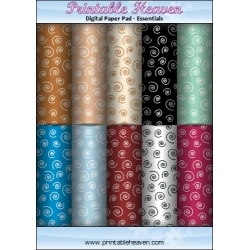 Choose from corrugated, crinkle, leatherette, two dew drop prints, mica, waterdrop, linen, mulberry and glitter. 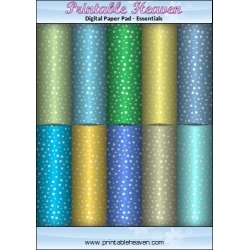 This fabulous Printable Heaven digital paper pad contains 10 funky A4 (29.7 x 21cm) polka dot crazy images that you can print over and over onto paper or card, whatever suits your project. 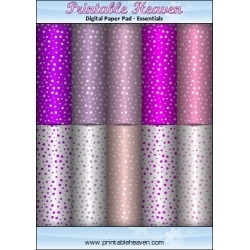 The range of lovely colours contained in it, from pale pinks through to lilac and purple, will mean that you have just the right colour-match for your design. 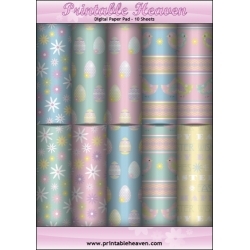 This beautiful paper pack contains 10 full-size A4 sheets which use lovely spring-fresh colours.The pad includes a pretty chick design, a wonderful Easter egg design, and a lovely spring flower design, all in three colourways. 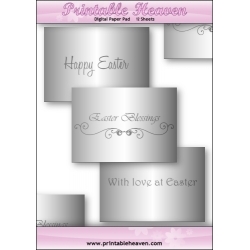 There is also an Easter wording sheet which is bound to be extremely useful. 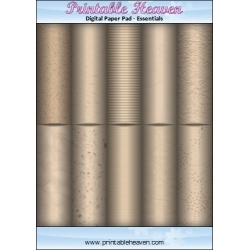 This is a great idea for those last-minute Christmas presents - teabag boxes!Give novel gifts of teabags with this fantastic money saving idea that means you'll be able to give presents that are just that little bit different this year. 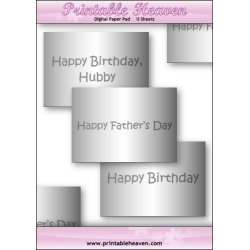 This set contains 12 inserts featuring male and birthday greetings in 4 sizes to fit 7" x 5", A6, A5 and DL card blanks. The inserts have been perfectly sized so they're a little smaller than the card-blanks mentioned so that they will fit perfectly. 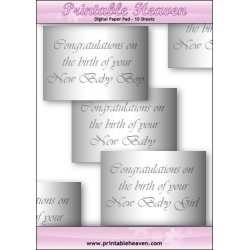 This mini-set contains 5 printable sheets featuring A5 birth announcements, a lovely matching envelope to cut out and assemble plus baby paper chains sheets to print the front and back of paper chains. 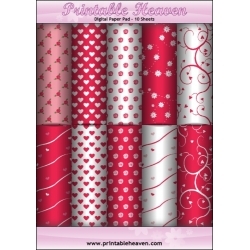 Paper chains make a lovely decoration when baby first comes home - perfect to create a beautiful room set for your many baby visitors.